Malioboro, is the name of an infamous street, and the icon of Yogyakarta, Indonesia. This street is a part of the philosophical imaginary symmetric line of Laut Selatan (the South Sea) - Keraton - Malioboro - Tugu - Merapi Volcano. Malioboro street itself is divided into two parts; Jalan Malioboro and Jalan Jenderal Ahmad Yani (the name used to be Jalan Marga Mulya). For domestic and international tourists, this street is one of the most favorite places to go when visiting Yogyakarta. Here, you can still see traditional transportation, such as carriages, pedicabs, and many others, giving ride to tourists along the street. So many vendors selling accessories and other ethical souvenirs are also present there; as well as malls and kaki lima. Malioboro is very lively, it seems like it never gets tired. Even at nights, the lamps keep brighten this street and the tire of economy keeps cycling; it never dies. However, did Malioboro look just like we see today; that crowded, bright, and such? I was trying to do some research on how Malioboro looked like after the World War II (around 1950s), and I found this picture. I didn't get the certain date of when this picture was taken, but it's enough to portray how Malioboro used to be. I'm pretty sure it's taken around 1970s though. To know the difference between the face of Malioboro today and the old days, I make a simple chronology though. 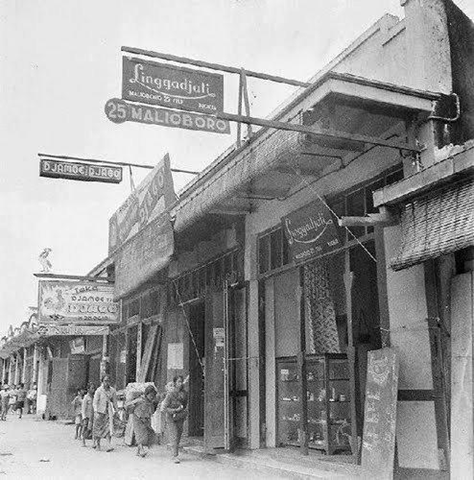 According to Djoko Pratjojo, in 1950, Malioboro was a nice street to walk. The street itself was only enlivened by pedestrians and traditional transportation, like carriage, tricycles, and bicycles. There had been vendors jazzing up Malioboro, but the number was not so many. Vendors, or pedagang kaki lima, usually brought their commodity back to their houses once the day ended. It is confirmed that even in 1950s, the area of Malioboro was the same with one that we know today, though in some old photographs Malioboro looked larger. The street used to be two-way road, but approximately, even in 1990s this street had become one-way road to any motor vehicles. Around this year, Malioboro reached its peak as the icon of Yogyakarta; as the city of art and culture. Artists loved gathering around the street and the overhang. According to Sutaryo's story, a humanist from UGM, in 1970s, every night many active artists and men of letter would gather together and did creative activities. 1970s was also the time when economical aspect started to increase; but still not as bustle at the very moment. Malioboro in 1970s was still clean. There were also no traffic jams whatsoever. The number of vendors in Malioboro increased significantly around 1997, during the monetary crisis. However, the area of Malioboro itself wasn't big enough to accommodate them all. They had to pay to be able to claim some swath for their own. The year 1990s was the year when Malioboro's face slowly changed from a peaceful street to do creative activity and nice place for pedestrians to a lively, crowded street as the center of the economic circle. It seems like in the early 2000s, Malioboro lost its face as the center art and culture of Yogyakarta. The significant changes were visible, as the government made the economical aspect more important than the cultural one. Billboards and malls were built. The function of Malioboro switched. However, in 2012, the government of Kota Yogyakarta launched the idea to restore the face of Malioboro as the center of Art and Culture as in 1970s. Many transversed billboards were cleaned, and the street of Malioboro were reorganized once again. Still, we could see the difference between Malioboro in the old days with Malioboro today, such as: the billboards itself, the traffic lights and traffic signs, and the presence of vendors as well, and the switched function of traditional transportation into transportation to attract tourists. 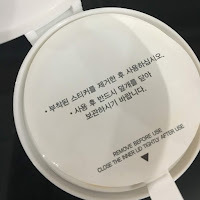 Get these stuff on Carousell! Copyright © Everything You Want's A Dream Away by Pudy Kusumaningrum. Ethereal theme. Powered by Blogger.